A delightful evening, lovely sunshine just the right weather to watch the Poppies take on Redditch, but not at the Valley. Instead of using our loyalty card at the Black Tap brewery tap Redditch, we’re going to Bedworth, marvellous! 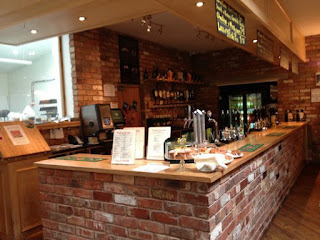 It was just after 5:15pm when we left Kettering, just a short trip tonight with a stop off at the Woodfarm Brewery tap. They had just 4 of their own ales on tonight, they usually have 8 but I’m sure we will make do. First up for Citra and Fuggles is Webb Ellis, a pleasant hoppy pale session ale and in decent condition, 3.8%, golden with a slight citrusy finish. The tight head held on to the bottom of the glass. Parker went for a Scrum, a 4.0% russet ale, malty and full bodied also in good condition. By now the Weebles have arrived and its good news, Petit Chemise has had is pass signed. We feared that Chemise had hung up his shirt and had become the founder member of the ex-PRATS club. Other Weebles included Marshall and Betweenthesticks. Next up was a new ale from Woodfarm, with their ales now under the Kendricks Brewing banner. Boadicea is a 4.2% golden ale, but this was not in good nick. Citra wanted to take his back to the bar, but decided to persevere, but gave up have way down. Just before we left the changed the barrel, no wonder it smelt like something Boudicca had worn when she was revolting on a daily basis. Now here’s a question, when I was a kid it was always pronounced Boadicea, when did it change to Boudicca? I’m sure Michael Caine would say, “It’s not bloody Boudicca, it’s Boadi bloody cea”. Struggling to down her ale, we decided it was time to move onto Bedworth and a game of footy. We haven’t done very well against Redditch for a few years and with our start to the season being quite sluggish to say the least we weren’t very confident. So when we were one down after 15 minutes the outlook wasn’t looking good. Then at half-time our manager had a huffy fit, unleashed a barrage of expletives in the direction of the players and hey presto, we play very well and win three one. Not many Redditch supporters made the trip, they were probably outnumbered by a factor of 5 to 1. So it was time to make our journey home taking in the Wharf Inn at Welford to have a couple of celebratory ales. As we pulled into the car park we could hear a rather loud jazz band strangling a cat, it may well have been a clowder of cats. There, I bet you didn’t know the collective noun for a group of cats, now you do. We hoped the beer wasn’t as flat as the trumpet, thankfully it wasn’t. They had a good selection of ales, but with Citra salivating for something from Oakham ales the Bishop’s Farewell pump clip was drawing him in like a moth to a flame. Both Citra and Fuggles decided to bash the Bishop down their throats, maybe I should rephrase that!!!. A lovely citrusy pale ale coming in at 4.6%, always very refreshing and easy to drink. Very dangerous thirst quencher on a hot summers day. Bishop’s Farewell was brewed to celebrate the retirement of Bishop Bill Westwood, Bishop of Peterborough. Some of the older farts amongst the PRATS more cultured readers may remember him doing ‘thought for the day’ on Radio Four’s Today programme. Parker went for Langton Brewery’s Traction, a typical ale for Parker, chestnut colour, 4.2% bitter. Both ales were in excellent condition. Pharp now arrived, the trombonist from the Jazz band instantly saluted his hero. No one can perform the ‘Boogie Woogie Bugle Boy’ whilst supping a pint, quite like Pharp, probably the world’s greatest Pharpsophonist. Pharp went for a pint of Marston’s Pedigree, it looked in good condition, lovely and clear. Pedigree has always been a decent ale, it’s been around for decades now first brewed in 1952, often blamed for causing considerably loose bowel movements. Not the ale for Pharp really but as it was close to the end of the day, the rest of the PRATS weren’t in the firing line. Citra went to the bar to get himself and Fuggles another delicious pint of Bishop’s. But a few moments later Citra returned with a face of absolute disappointment, almost in tears. Bishop’s had sold out. He was sent back to get whatever he wants. He came back with Tollgate Brewery’s Talaki IPA, 4.8% pale ale and with a name like that it’s almost certain to have a few new world hops somewhere in the mash. It was very nice, a golden ale, quite bitter at the end, that would be those new world hops kicking in. A decent ale to finish the night off. All in all; a decent night out, some decent ales a good result with a decent performance although I don’t think Redditch will be the force this season as they were last. Next up we go to Basingstoke, we haven’t been there for a few years.